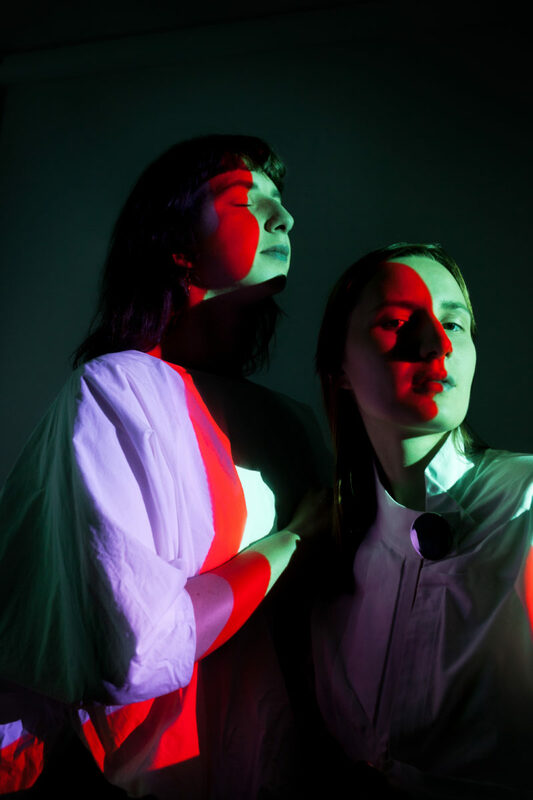 Antonina Nowacka & Bogumiła Piotrowska explore the endless possibilities of video feedback and extended vocal techniques, blending both into an overwhelming synaesthetic experience that is as elegant as colorful. They released last year the highly recommended self-titled AV album (dvd + cd, Zoharum records) which proves that they are one of Poland’s vanguards of the new generation experimentalists. Jürgen De Blonde interviewed the duo about psychedelic experiences, non-conventional concert contexts and modes of perception. Artists in conversation. Your work is situated somewhere between performance and instal­lation. What is the importance of performing live for you? The live performance is a very special situation ruled by its own rights. It is not even like when we are meeting for a rehearsal or recording session, the energy is completely different. The certain perspective of executing the particular state of mind in the relation to the space, time and every single person of the audience is allowing some things to happen, things which do not exist in any other circumstances. Actually, it is also interesting when we think of a rehearsal in front of the audience, but still having in mind that this is a rehearsal, not the actual live performance. We were thinking recently of doing one like this to see what happens and if it is even possible. For me this is the core of our activity. The releases introduce people to our work worldwide through the internet or are the material reminder or the collector’s rarity. The live performance is something more than music and visuals, as many of our receivers indicate. Yes, live performance is crucial for me. This creates unique space-time, in which our minds and bodies are involved. In simple words: it is an ongoing experience, sometimes it is an ordeal, a trial. I find it exciting. Also during the live show, there is so much processing in my mind and after all I come to conclusions not only about what we’ve just done on a stage but about society, religions, rules and ideas. And what is more pleasant, I feel connected with myself. Would you consider pure installa­tion work, maybe as a substitute for live performance? Well, as you noticed in our answer to your first question our work is a bit like an installation already. I like to create situations being in between as these are opening up the locks. Of course it is extremely difficult on the very pragmatic level as when you are not defined you are not in a concrete social environment... you don’t have a target group nor specified, regular audience. But, I don’t like pragmatism in general. However, yes, it would be interesting to do a proper installation, although surely not as a substitute of live performance, but a new situation. I wonder how would it be like. I like the concept of creating an installation and I think it is an adventure. There’s an obvious psychedelic aspect to your art. What is it you are exploring in terms of the psychedelic/spiritual? I think I am exploring myself. There is a whole universe in every human being. I like to work on myself as a material. Sometimes there is an enormous beauty I want to convey, things that I remember from dreams and other psychedelic experiences. Sometimes these are aspects of everyday life that I encounter, people talking too much, being over confident. It is almost like a mockery, damn crazy grotesque theatre and it makes me laugh. Sometimes it is the simplicity and unpretentiousness of nature — organic matter taking over and absorbing everything. Looking at us, humans, with a pity and really having control over everything, like in some animation works of Julian Antonisz (non-camera chronicles). But also to lever all of above. To abandon the cause and effect aspect of linear narrative, creating a kind of poetic logic. This is all much better captured in words in the writings of Tarkovsky, Grof, Hesse. Psychedelia in formal aspect of my work is obvious, as my technique is from the time that was called psychedelic, as we can get wind of it, because of similarity to colorful visions enduced by psychedelic substances. Sight is a very powerful sense. But this is an effect of what is psychodelic. We can see the visual representation of space/time dynamics. We can induce this effect by certain devices, and it is possible that after switching off these tools, or changing the way of sending and receiving the signal among them, there is still this void. What I explore is the awareness that these colours and shapes exist in nature and that process of growth and creation we can observe in our bodies, in human relations, and in other person’s eyes. For me it is an experience in which I have a chance to explore the ways of growth and decay, processes of creation and death. For me there isn’t always a clear link between what I see and what I hear. It doesn’t always seem to be a mani­ festation of the same intent or mind­ set. This is not a point of criticism, just my experience. Sometimes the relation is clear, sometimes not. Yes, I agree. It is probably because we don’t really have a plan of how the performance is going to look like in formal term. Therefore, we might have a different interpretation of some happenings... I like that. It creates the space for the narration, the very abstract storytelling. What is the relation between the audio and the video for you? Visuals are not there to illustrate the music nor is the music there to soundtrack the visuals. What is sound and what is a vision — it is one: it is an electro- magnetic wave but in different frequency. For me it was always very close to each other. However music is eternal for me, I have a big respect for it. Maybe that is why I care so much about the sincerity and about not being mechanical in my activity. I like to co-create the music with different tools, I like to share my authority with machines, time and air. And I can observe that these audio and visual waves can connect if I do not disturb them. Honestly I feel a little bit like a mother of these tools. I have a son and it is a similar behaviour. What is the relation between audio and video is the same as relation between us. The process of making sound and making video is different. Are there also similarities in process? And what might they be? In our case I think the most interesting is the feedback issue. I knew that B’s technique is based on the optical feedback, but some time ago I found out that the process of giving the voice is also based on the feedback between the resonators in human’s body. I got excited. Would you see yourself taking a similar approach in making your art by means of pure digital material like computer generated visuals and hd audio and pro­ cessing? Or is the quality of the medium — the grit, the dirt, the noise — essential to your output? It is fantastic that you are asking this question as recently we have a lot of thoughts and discussions about this. For me the quality of the medium is a very important aspect; not the dirt and noise but rather the subtleness and the endless possibilities of spreading the matter. There is a vastness of little things to emphasize. The digital, on the other hand, is finite. But it is evolving so much recently that this limitation at some point might go beyond our human perception and become unnoticeable. In terms of audio, for me the voice is the most direct tool which corre- sponds directly with what I have on my mind without any intermediaries. I can- not see any equivalent among digital tools at the moment. We will see in the future. I can imagine replacing voice with the instrument reading directly all the data from my mind and body and creating a perfect match sound with the sophisticated precision. But then, what is the point? We got given our voice to use it. At the moment we are preparing the collaboration release with the Berlin producer Christoph de Babalon and the visuals are going to be 100% digital. I am curious how is this going to work. First of all, quoting Rosa Menkman: “The dominant, continuing search for a noiseless channel has been — and will always be — no more than a regrettable, ill-fated dogma”. In other words, the noise is essential but does not determine the medium. What I like in these ray tubes, is that they have a space in themselves, what I mentioned earlier, I can feel it and let it go. I think of what’s inside that image, as a sculpture. Computer of course has also a space inside, there is a pixel and it has some space in itself, for the chemi- cal processes which emit the light, but, it is so small! What I do for this new project, I work with some softwares. I like the clearness and quality and the fact that I order them what to do — the power over it makes me feel good. I would love to see one day an image from video ray tube in equivalent of 13K. It could probably explode.